I would like to share some thoughts about my newest work called “346. A journey while staying as still as possible”. This work was inspired, and is on the surface, about my 7 week stay in hospital in 2011. It is a piece of book art, and as such it is – first of all and at its core – a book. But all its aspects: the text and the illustration as well as its presentation, the specific book format, the cover design, the box it sits in and all additional bits; all together they form part the artwork. Everything has been made by me, and all of it together is meant to convey my message, not the text on its own. In November 2010 I found out that I was pregnant, and shortly after I learned that I was carrying twins. In gestation week 21 I was admitted to hospital due to premature labour. I was told that the most likely outcome was the birth of my children that very night, and that they had a life expectancy of about 30 minutes should they indeed get born. I was put onto a reclined bed to reduce the pressure onto my cervix, and was told to keep as still as possible, to prolong the pregnancy for as long as possible… I am going to reveal more about my story, and what I intent and perceive as the important subtext of it. But because the whole is the artwork, not just the text, I want to start my series of blog posts about the work with talking about more technical aspects, followed in the next days and week by details of the model and graphics in the scroll, before I’ll come back to the story itself. 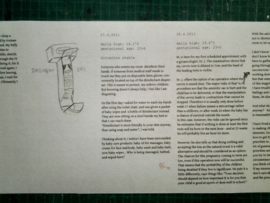 So here are the first technical bits: Not uncommon for book art, 346 is made in an edition, in this case an edition of 10. 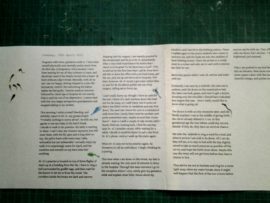 The first two copies are (going to be) printed on a handmade paper and are slightly larger than copies 3 to 10. 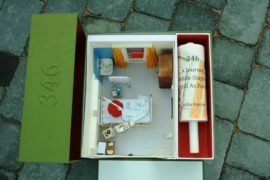 Also the first two copies are accompanied with a model of hospital room No. 346. There is a large box in which the scroll and the model both sit. 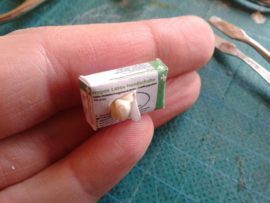 Copies 3-10 are slightly smaller, and sit in a simple lidded box (without a model). 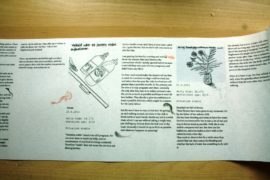 For all copies the scroll is printed with pigment ink on a digital printer. 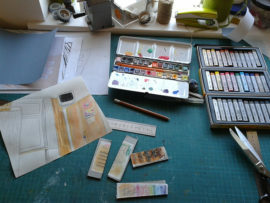 The illustrations are partly drawn from a visual diary that I kept while I was in hospital, and partly they were made years later when I made the book. 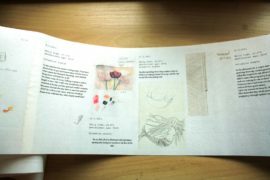 The scroll is made from Japanese paper (copy 1 and 2 are printed on Dosabiki Masa Shi, a handmade paper; copies 3-10 on Masa Shi, a machine made Japanese paper) and fastened to a wooden dowel. 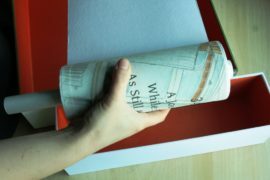 The case the scroll sits in is made from cardboard, fabric and felt, printed upon with pigment ink. 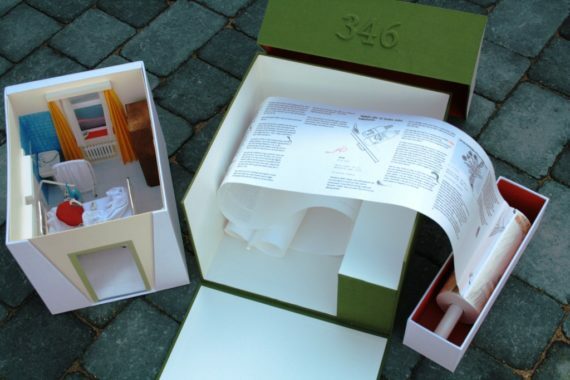 The box is made from cardboard, Efalin linen laid paper, and book fabric. All images in this blog post are of copy No. 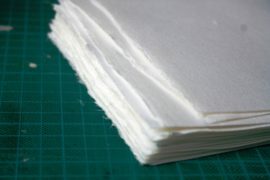 1 which was exhibited as part of the society of bookbinder’s annual bookbinding competition in London this summer. I am currently in the process of editioning: Obviously copy 1 (including the model and boxes) is finished. Currently I am working on the boxes and cases for copies 3-10. The model for copy No. 2 is also finished, but the scroll is not yet printed, and the box for both will get made once I finished the rest of the edition. No. 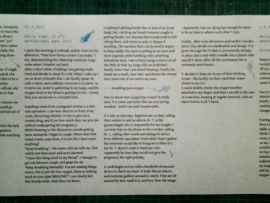 1 is an exhibition copy that is currently not for sale, the rest of the edition will be. maybe a summary – depends really on whether I’ll feel I have said it all or something else needs saying. If you have any comments or questions at any time, please do let me know! I hope you are interested and will “tune in” for the next post. I have been writing here in several posts about my latest work “346. 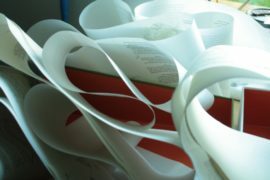 A Journey While Staying As Still As Possible”: I have explained how the format, the accompanying model, the visuals and the contents of my book all are supposed to play together in this piece. 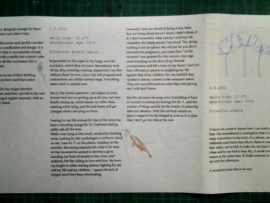 I have written about the format I have given the book, the model, and the visuals of the scroll. Today, finally, I want to talk about the contents, the text itself. As mentioned before, it is a day by day recount of the most difficult phase in my pregnancy with twins in 2011. Not everything is exactly how it happened, this is why I wrote on the first page: “A story, almost true”: Some of the things I don’t remember exactly, and I changed some details deliberately for the sake of the story. There were far more nurses in hospital than make an appearance in this story,and I have attributed some different occurances to the same figure in the story, for example. Pregnant with twins, gestation week 21. I have been unwell physically and mentally pretty much from the first day of pregnancy: Since January I have been waiting for my all-day-sickness to cease, and about last week it has finally turned into a heart burn without a day’s break. Mentally, well, let us say I am not happy, feeling trapped in a new life beyond my control. Not welcoming the babies makes me feel guilty. Various medical concerns followed by check-ups in hospital do not exactly help to pull me out of my depression. I cannot deal with the very happy prospective grandparents and stopped talking to my mother. This morning I notice a small bleeding, and dutifully report to Dr. N., my gynaecologist. “Probably nothing to worry about”, he tells me, but agrees to see me today in his lunch break. I decide to walk to his practice. My belly is starting to show. I can’t close my trousers anymore, but still wear them, with the fly open and a long shirt on top. My pelvis hurts with every step I take, noticeably but not unbearable. I actually enjoy my walk: It is surprisingly warm for April, and the sunshine and warmth on my bare arms feel soothing. Dr. N.’s practise is located on top of three flights of stairs up in a building from the 70s. I have to ring a bell surrounded by graffiti tags, and then wait for the buzzer to let me in from the street. The corridors inside the house are dark and narrow. insists that I check in to hospital “to let them have a look”. This would not be the first time that I call M. from here, ask him to leave his office and cycle back home, get the car, pick me up and drive me to hospital. This time, however, Dr. N. insists I get a taxi rather than to wait for M. He almost pushes me out of his surgery, telling me to hurry up. a cash machine down the road not too far away, so I walk there, but it turns out that it has fallen victim to vandalism and was shut down. The next one I know for sure is a substantial walk from here. Surely there must be another cash point somewhere near, maybe around that corner there? – And so I walk a couple of side streets until I finally find one. Coming back, I find the taxi bay near Dr. N.’s practise vacant. After waiting for a while I decide it would be faster to call a taxi from Dr. N.’s phone. And so I walk up the stairs again. When Dr. N. sees me in his practice again, he threatens to call an ambulance. I laugh, thinking he is jesting. and asks me to wait until someone has time for me. More time passes while I wait. M. arrives and waits with me. Eventually I am seen by a midwife. She asks me to undress, and I lie down on the examination bed. She takes one look, gasps, and runs to get a doctor, shouting over her shoulder I should have indicated how urgent this was. – Now I really would like to know what is going on! The doctor is with us only moments later, and she finally explains: I am in the middle of giving birth, the cervix already dilated to 2 cm. At this gestational age the tiny babies could slip out any minute. If they do, they have no survival chance. am told to lie down. All I can do, they tell me, is to stay in bed with the hip slightly raised to take as much pressure as possible off the cervix, and hope the birth slows down. Maybe this way the twins will not get born before they have a chance to live. They advice me not to hesitate and ring for a nurse right away when my water breaks since it might well happen that the first of the two is born before anyone can be with me. They offer me a Valium to calm me down, but I decline – I don’t feel frightened, just stunned. always help, I feel like I am disgusting. On the first day I asked for water to wash my hands after using the toilet chair, and was given a packet of baby wipes and a bottle of disinfectant instead. They are now sitting on a stool beside my bed so that I can reach them. “Disinfectant is more friendly to your skin anyway, than using soap and water”, I was told. One of the topics that are dear to my heart in general and which I see as central in this piece is how pregnant women are treated by doctors, by their families, but society in general. I felt almost unseen, had the impression people interacted more with the idea of my future children than with me myself and felt reduced to my ability – or not – to deliver these children. I spent the morning in solitude, and M. visits in the afternoon. “Hear how funny a noise I can make.” I say, demonstrating the wheezing sound my lungs make when I breathe out hard. After a short while of talking I am getting really tired and decide to sleep for a bit. When I wake up I am so short of breath that I can hardly speak. M. calls a nurse, and suddenly everyone is in alarm. As it turns out, water is gathering in my lungs, and the oxygen level in my blood is getting too low. – Funny that you can drown in a hospital bed. xpelling water from a pregnant woman is a delicate operation. I can hear doctors in front of my room, discussing whether or not to give me a certain drug, and if yes how much they can give me without endangering the pregnancy. While listening to the discussion outside getting more animated, I begin to cough. Where does that bread crumb come from, it is not like I have eaten anything? “Keep breathing”, the nurse with me tells me, first calmly but then more and more alarmed. “I have this thing stuck in my throat”, I manage to get out between coughs and gasps for air. “Keep Breathing Normally! You are making things worse, this is just the low oxygen, there is nothing stuck in your pipe! BREATHE!” I can clearly feel that breadcrumb, what does she know. that breadcrumb is still sitting there, and seems to slip in deeper if anything. The machine that I am hooked to begins to beep wildly, the nurse is yelling at me while fumbling with something behind her back. I am so busy trying to force out all the little air that my lungs still can hold that I hardly notice that I am almost fainting. Finally she hands me a small, clear tube, and directs the stream that comes out of one end to my nose. Did you know that oxygen has a taste? It really does. It is sweet and tastes like sun on a spring meadow. And it can melt breadcrumbs. 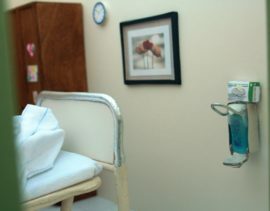 While I was lying in this small, windowless birthing room, waiting for the cardiologist to arrive to check on me, I saw Dr. T. on the phone, standing on the corridor, discussing emphatically what to do next. At that moment he seemed to develop a glow, standing out from all people in the room, and I suddenly felt like falling in love with him. My hero, my knight in white shining armour fighting for me and my life and my children. – I guess the lack of oxygen must have been intoxicating. Curiously I was not afraid of dying at any time. share my room was going in and out of hospital during my stay there, and her difficult pregnancy ended with the death of her baby girl. My twins survived. They were born on 1st of June 2011, after I had spent 42 days lying in bed with my head down. 42 days which I spent in a weird limbo where time seemed to stand still. parents happy – that’s not their job, and it’s not true for everyone. No every pregnant lady feels like being congratulated, even if she might have tried for babies before. We should stop talking with women as if they were babies, just because they are expecting or having them. And we should stop assuming that we know how they feel. Well, that’s my key message I guess. I hope some of this comes across in this work. And while for me it all comes together nice, I hope it also does for my readers: the room from which someone fled, fish, drawings, pregnancy, babies. P.S. : I find this a-n website very hard to navigate, especially when it comes to the blog feature. If you are working on something similar, either in content or in form, I would love to hear from you. – I am trying, but maybe I just can’t find your blog here. If you would like to see more of my work, I’d be delighted if you visited my website at kurzke.co.uk. – I hope I’ll hear from you! P.P.S. : Any kind of feedback is very welcome, public or private, critique, confusion or praise, that of course, too . P.P.P.S. 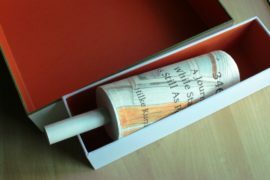 : I am currently working on the rest of the edition, the 8 scrolls that will be available for sale without the model. That’s what you can see on the last picture, the current state of progress. The centrepiece of “346. 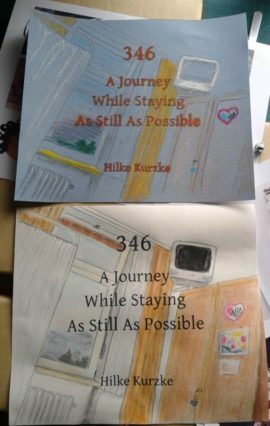 A Journey While Staying As Still As Possible”, a piece of book art about my experiences during a difficult pregnancy with twins is of course the book itself. 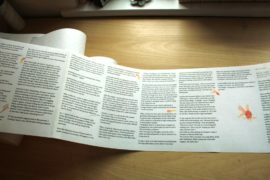 I described the format – a scroll – and the reasons for choosing this format in my last blogpost. 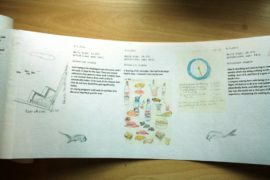 In this post I want to show you the general visual appearance of the scroll, and in my next and final post I will speak about the text and what it says and tells. The scroll sits in a cardboard case, and this is covered by fabric onto which I drew a view of the window from my bed. It is a motif I drew a couple of times in my journal back then, and also a view from which I took a photo. I made this specific image at my desk this year, looking through photos and previous sketches. 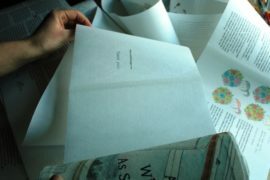 It is drawn directly onto the book fabric, sprayed with clear acrylic to reduce rubbing off of pigments, and the title and my name are then printed on with a printer. When you unroll the scroll, you can see immediately that the book is written as a daily report like a diary. It always starts off with date, gestation age of the twins and temperature. I had to research the temperatures while writing the book, but they were essential to the experience: Although I stayed in hospital from April to June, so not the traditionally hot months, we had daily highs in the upper 20’s throughout (26°C, 28°C ,… even 32°C on May 31st). For most days I have one larger image, drawn from a visual diary that I kept at the time. Striking and maybe surprising is the amount of fish on the pages. They feature both as large “image of the day” and are also strewn in between the lines and swim across pages. I drew my first fish there in hospital. — Well, I suppose as a kid I must have drawn a fish one time or another, but you know what I mean: Until then fish had not made an appearance in my artwork. It was at first a completely subconscious thing. I used to be a written journal kind of person, and while waiting there had the time to keep a journal, also felt like this experience was something I should maybe record. But somehow words didn’t want to come, and so I figured it was time for a daily sketch habit. And I often picked a random thing in my room to sketch. One day I simply made some doodly lines and circles on the page, and filled the spaces between crossings with pattern. Not very productive, but what don’t you do when you are bored. One of those shapes looked like a fish to me, and so I gave this scribble the title “fish”. In one of the next days I sketched the view from my window. When I bend over just a little, I was able to see the roof of another wing of the hospital. Above flew some birds. I drew fish instead. No idea why. Then greeting cards came in. 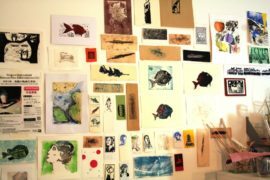 I answered all them with hand-drawn postcards, and on the first of them I put a “king of fish”, a silly drawing of a fish swimming between seaweed and wearing a crown. And that was really the start into drawing fish. 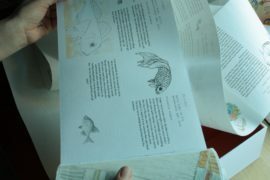 I asked M. to bring me articles about fish anatomy, I asked for scans of the tables in our encyclopaedia of fish, and I started to copy those images. Soon I was drawing a fish a day or more. Now, fish and I have a difficult relationship. I have a recurring nightmare which is based on a real occurrence: When I was a small kid, I visited an aquarium with my parents, and in one of the tanks was a big albino carp on its own. I was fascinated and appalled by it at the same time, the way his skin was almost translucent. I put my hands on the glass and pressed my nose against it in an attempt to see it from the side to see whether I could see its organs. The fish’s and my eyes locked and were at the same height. Then the fish opened its mouth, wider than I thought possible, and I stared at it, surprise by how far into the fish I could see, and then it started regurgitating bits of whitish cake, almost spit it at me. I stumbled backwards, in utter disgust, and now could see that more of the stuff was already swimming on the surface. Ever since I find fish revolting. I don’t like sitting near aquariums, have a hard time going over a fish market, and I don’t swim in lakes. But all in all didn’t give them much thought. 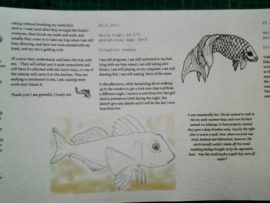 And then I found myself in hospital, studying fish, and drawing them. When they came out especially life-like, my own drawing would give me goose bumps and looking at it too closely make me almost physically sick. So why did I do it? – As outlined above it wasn’t a completely conscious decision. But although I find them repulsive they do fascinate me, in the same way that I couldn’t take my eyes off that carp in the tank back then. Drawing them was an outlet for what I was feeling, for what I didn’t have any words or other images at the time. While I was drawn to them subconsciously in the moment, I added a lot of more drawing to specifically include them in the scroll. Almost all of the small fishes have been drawn specifically for this purpose. For me they no longer only represent what I felt in the situation. They do still generate -for me- the uneasy feeling the text describes. But there’s more: My twins were further along while I was there in hospital, and did no longer look like fish on the ultrasound. But they were sitting in water. 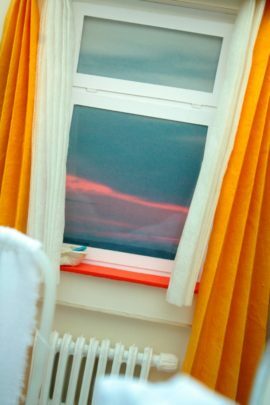 I was locked in that room, looking out onto the world through the glass of my window. There was this feeling of being looked away, maybe like sitting in an aquarium. For other readers/viewers of the piece might represent something else. In depictions of fish in Western art it often stands for abundance (of food), and many who have twins feel like they have been blessed by an abundance. And fish in dreams are often interpreted as a foretelling of good things to come. Ever since then that hospital stay, fish have featured in a lot of my artwork, I draw and print them frequently. After I finished the work on this scroll, I felt relief and think that maybe, once this is all done, I will be through with drawing fish. But my fish depictions evolved over time, and they are often no longer life-like. Especially smaller stamps I made with fish show them with a cute or funny twist and don’t find them that disgusting anymore. 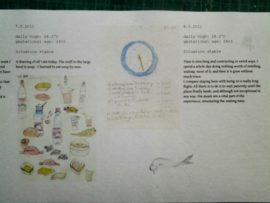 If you would like to see some of my more playful fish prints, try the slide show on this page about my message in a bottle project (artwork that relates to nursing the twins, actually), fish feature big in there, too. If you are not a book artist or a collector of rare books, chances are that in your bookshelves there will be very little else than industrially bound books, with a spine at which a stack of pages is held together. You can leaf freely through these pages. This book form is very useful for dictionaries, as the book can easily be opened at any position. But despite its overwhelming presence (and usefulness), it is not at all the only form a book can have, and it is not in all cases the best to use. This is the second blog post in a series about my latest work “346. A Journey While Staying As Still As Possible”. It is a piece of book art about my several week hospital stay in 2011 while I was pregnant with twins. I entered hospital in gestation week 21 in early labour. They told me that the most likely outcome was a miscarriage the same night. The babies had a life expectancy of 30 minutes after birth at this stage. They gave me a valium, put me on a reclined bed to take the pressure off the cervix, and told me that if I felt something that was even remotely like my water breaking I should ring for the nurse immediately because it was quite likely that the first of the twins was born before anyone could be with me. – Good night, best would be to sleep, try to move as little as possible. Yeah… I didn’t sleep awfully much that first night, despite the diazepam. From this onset it should be very clear to the reader: the book will end with the birth of the twins. The question and moment of tension is: will I remain pregnant for long enough for them to live? It is what most people immediately ask me when I tell them about the book: “What about the twins, did they survive?” – and I imagine that readers might want to skip forward and read the end first. – I don’t want that to happen. I want the reader to experience some of what I experienced: this strange mixture of boredom while waiting hour after hour, day after day, and the constant tension about what will happen at the same time. Psychologically it’s a strange thing, to wait so long for something awful to happen, to think that any minute it could be the end, both of this awful waiting (and I wished for it to end at times), and of the idea of having these children. Because you make room in your head and in your life for these two, the idea that there might be no-one there in the end to occupy this space seems almost absurt. Still it is something you are told to expect any minute. Of course a reader can’t really experience that by reading a report, but I definitely wanted to keep them from skipping forward. That’s why I had a scroll in mind from pretty early on. Of course you can fast forward a scoll, just skip over parts of the text. But you would still have an impression of what comes in between, an impression of length, and also it takes more effort going back and forth, and thus it is maybe more discouraging to do it. And so I started to investigate different types of scrolls. In my research I learned about panoramic scrolls and crankies. The structure for both is the same: both ends of the scroll sit on a dowel each, and both dowels sit inside a box. By cranking one of them, a different part of the scroll can be seen either on top of the box (if the scroll goes out and back in) or through a view top. Reading a story like this you are forced to be very much in the moment; you can’t see much of what is coming, which is good, and I liked the idea – until I realized, that it not only rids the reader of “knowledge about the future” it also eliminates memory of the past. And this thought lead me right to the form that the book has now in the end: only the end of the scroll sits on a dowel that sits within a box, a cylinder to be precise. The other end has to be pulled out by the reader to see more of the story. This cylinder keeps the reader from knowing how much more is left on the scroll. So when it looks like the birth is progressing, there is no “surely this must be a false alarm (again), there are just too many pages still left in this book”. 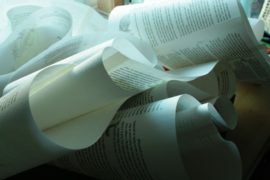 But while thus the future remains hidden, the past can be seen very well, day piles upon day upon day the paper spilling out and piling high while you read on. This is a first blogpost in a series in which I want to share images and thoughts about my newest book “346. A Journey While Staying As Still As Possible”. It comes in an edition of 10, and along with the first copies of this book about my 7 week stay on a reclined bed, I made two models of the hospital room which vary slightly (images are of model and copy No. 1) but are essentially the same. I tried to make a true model of the hospotal room I stayed in. My memory is aided by a few photographs, but I don’t have many. While I was lying on my bed, I didn’t really think of taking many pictures. My main entertainment there was watching the sky, and I have a range of photos of the window and the sky (the picture that I put on the window in the model is an actual photo I shot during the time through that window). But I don’t have taken any when I was able to get up and stand again; I was too focused on finally leaving my prison cell to want to capture and preserve it. But for the model I was more interested in the atmosphere than an actual representation anyway. And so there are some deliberate changes to what might be considered a “true” representation of the room. For once, the bed is larger in scale than the rest: I wanted to make its presence overpowering. It was my world, after all, and it is more important than many other aspects. But things like the curtains, the wardrobe, the poster on the wall are all as close as I remember. The items made for this room fall into a couple of different categories: there are architectural elements, like cable channels, the window, the shape of the room itself, lights and sockets. There is furniture: a sink, a screen, a wardrobe, a table, chairs, the bed of course. The radiator maybe falls somewhere between these two. 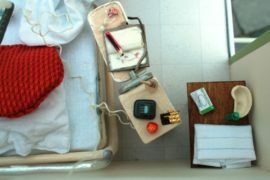 There are small items put in by hospital staff: a crucifix over the door (it was a Catholic hospital), a television and a telephone, kidney bowls, sheets, pictures and a clock, things like that. When I started to make the room, I also started a list of items that were in this room, and the sheer amount of items on that list was amazing and intimidating. Every time I thought the list was complete, I remembered something else. Like the jug with which they would fill a baby bath to bring to my bed to wash. – Who would have thought that a principally barren room could hold so many different items? In the end it seemed impossible to really bring them all in. And so I made a couple of items that I found no place for. The room felt empty and plain to me. When I put in more items than I have now, it started to look more like a storage room to me. So I decided against putting in a model of the television, for example – although it is mentioned in the text. But it is mentioned because I let it turned off – to the surprise of staff. And thus the television didn’t play a real role for my life there, and I left it out. Then there are tons of small items that I had with me there, like piles and piles of books and magazines which well-meaning visitors brought and sent, which I never read, and which easily overpowered the room; so I decided to just put in two in the end. There are some items that actually were rather important for me and still didn’t make it in. There are, most noteworthy, two chairs missing: the one my husband would sit on when he visited and a toileting chair. However, with the bed overpowering big, putting those two in would have made the room too full; instead of complementing the atmosphere they would have changed it too much. There are a lot of details in the room as it is, and I had to learn a couple new skills to make the models. I learned to work with polymer clay, for example, which I used for the apple and the chocolate. 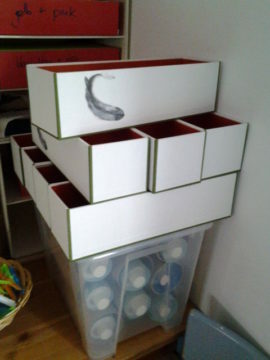 I worked with mouldable plastic from which I made the bed, and disinfectant bottles. 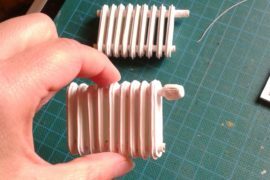 I also worked with air-drying clay which I used on the radiators. I learned to make fake tiles for the wet area in my room. 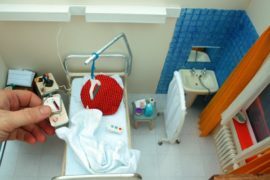 One of my blog readers sent me a crochet heart for a key chain holder when she read that I was in hospital, and I used it on the key in my hospital room. And so I learned to crochet a miniature crochet heart that actually does sit on the key on the wardrobe. For the kidney bowls I made moulds from polymer clay and then made them in a painstaking process from paper pulp made with thin Japanese paper. The biggest decision for me was whether or not to put a model of myself into the bed. And, as you can see, I didn’t. It looks like someone lay in the bed, stood up and walked away. It was my favourite daytime fantasy for more than 40 days, and I recreated this fantasy with this model.